"A Quiet Place" only cost about $17 million. Paramount Pictures has just about tripled its investment, and we're only three days in. Taking the No. 1 spot this week is the most original take on horror we've seen since "Get Out." 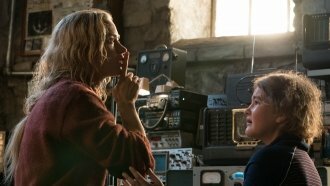 "A Quiet Place" brought in a monstrous $50 million in its opening weekend. That's good for the second-largest box-office debut of the year. "Ready Player One" won that title and lost it in a little less than a week. But where Steven Spielberg and company spent a cool $175 million, "A Quiet Place" only cost about $17 million. Paramount Pictures has just about tripled its investment, and we're only three days in. The good news continues for director and star John "Jim from 'The Office'" Krasinski. Along with being a box-office hit, "A Quiet Place" is one of the best reviewed films of the year as well. "Just the first 10 minutes of this film are just this excellent study in short-form tension. … It's easily the scariest thing I've seen in a long, long time," Matt Atchity said on What the Flick?! Seeing how it's holding on tight to a 97 percent score on the Tomatometer, many analysts are predicting a strong second weekend as well for this already lucrative thriller. Falling to No. 2 this week is "Ready Player One," bringing in an estimated $25 million in its second week out. This gamer pipe dream film continues to perform very well overseas, nearly tripling its domestic haul at the foreign box office. Rounding out third this weekend is "Blockers," bringing in a solid $21.4 million in its first week out. Blockers is also that rare raunchy comedy with good-to-great reviews. John Cena's latest has an 83 percent score on the Tomatometer, and all he had to do get it was chug a beer — with some creativity. As for next week, "Zookeeper" meets "Godzilla," plus the only actor ambitious enough to give this a shot.